CrossBreed® Holsters is celebrating the return of one of the industry’s largest gun and gear promotions by inviting fans to participate in the event. 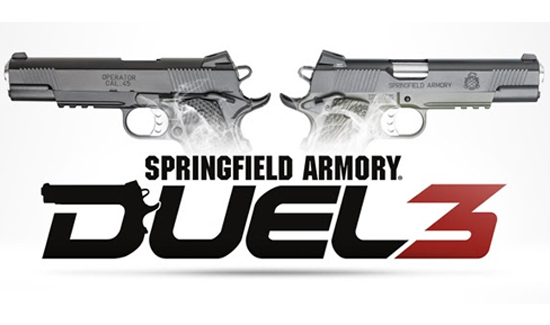 Springfield Armory®’s DUEL 3 promotion runs all September long and will include hundreds of daily and weekly prizes, as well as one month-ending grand prize valued at more than $6,000. All fans need to do to participate is CLICK HERE, vote on weekly head-to-head matchups – up to once an hour to increase your chances of winning – and wait and see if you’ve won. CLICK HERE to register to vote in the weekly “duel,” in which two Springfield Armory® firearms are pitted against each other in a side-by-side comparison. Among the prizes up for grabs are gear from dozens of sponsors, such as the CrossBreed® Holsters, and more than 125 Springfield Armory® firearms. Learn more about CrossBreed® Holsters at crossbreedholsters.com.